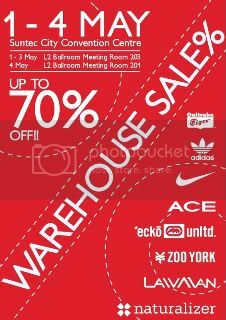 Yours truely’s company is holding a Warehouse Sale this coming Thursday to Sunday, on the 1st of May to 4th of May at the Level 2 Ballrooms of Suntec City Convention Centre. Time is from 10am to 10pm. 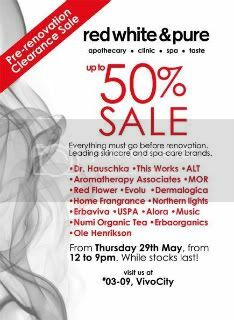 Please kindly note that the first three days of the sale will be in Room 203 while the last day of the sale will be in Room 201 due to Suntec’s room availability. Brands include: Onitsuka Tiger apparel and shoes, Adidas apparel and shoes, Nike apparel and shoes, Ace bags/luggages, Ecko Unlimited apparel, Zoo York apparel, Lawman apparel and Naturalizer shoes. I will be working there during these four days. See if you can spot me! Comments Comments Off on Warehouse Sale!